don't know if you've already read the Fonica i Thorens – historia pewnej współpracy (Polish) article by Mr Paweł Cendrowicz and Maciej Tułodziecki that was published in september's issue of the „High Fidelity” (No. 161) – if you haven't let me encourage you to do so. It shows the mechanism of contacts between Polish audio companies looking for their place on world's market and the Western brands in the 1980s and 90s, where the Polish entity was always the weaker party and was usually left with nothing. In turn, the history of the Czech branch of Tesla Litovel, which after transformation became SEV Litovel Company and today is the key part of the Pro-Ject Audio Systems in their efforts to offer customers ever improving sound quality, is an example of s successful cooperation of this type. The privatization of large companies from behind the Iron Curtain producing audiovisual equipment had no common denominator, except that it was fast and required profound changes in the employment structure, different, market-oriented thinking and defining own place in it. When reading the history of the Audio-Hungar company, the owner of the Qualiton brand, I thought I witness a deja vu. This brand continues traditions of the largest Eastern and Central European electroacoustic equipment manufacturer founded in the late 1940s, the Rafilm National Radio-and Film. 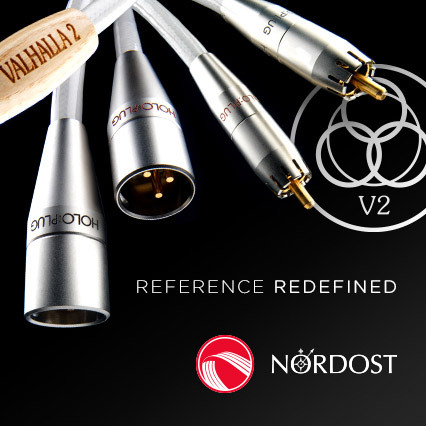 The changes in company's name - 1951: Audio Voice-and-Film Technical Co., 1960: BEAG (Budapest Electroacoustic Factory), 1990: Univox Kft - is also something we also know from the history of Polish companies. In this case, there seems to be a happy ending. In 2014, the Univox Kft was bought by Audio-Hungary Kft. The first amplifier from the two companies, the Univox APX 200 power amplifier was introduced to the market a year later. It that was sort of a tribute to BEAG's highly acclaimed APX 100. The current product line bears the Qualiton logo. It is divided into two series: Classic and A-series. The former consists of only two products - the APR 204 preamplifier and the APX 200 power amplifier (rebranded Univox APS 200), both stylized for 1960s with tubes hidden inside chassis. 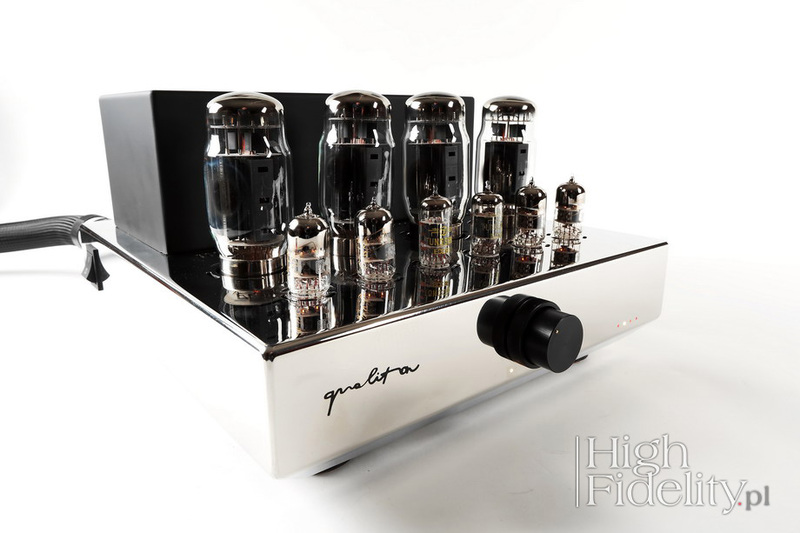 The latter includes four products - two integrated amplifiers with exposed tubes: A20i and A50i, a phono preamplifier and a step-up transformer simply named MC. The reviewed amplifier, A50i is currently the most expensive product. 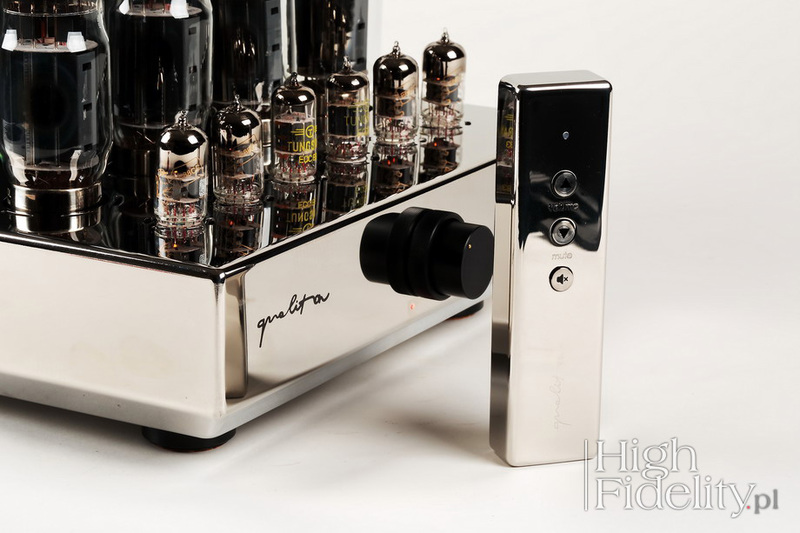 This is an integrated, class A, push-pull tube amplifier, featuring Tung-Sol KT120 beam tetrodes. Since the device features an auto-bias function one can replace these tubes with KT88 and even KT150 can be used. 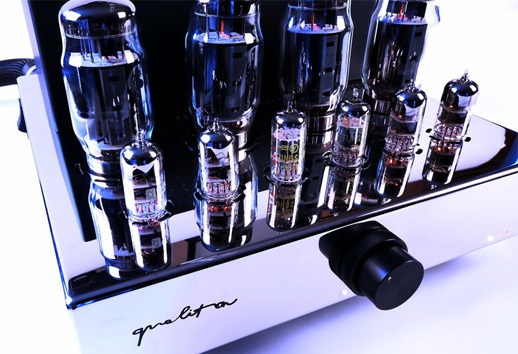 The input section uses NOS Tungsram ECC83 and E88CC tubes from the new Genalex Golden Lion production. The amplifier is surprisingly compact, but the weight says the story: there is plenty of iron and copper inside. This tube amplifier operates in Class A to deliver hefty 50 W output with a very low distortion and noise - respectively <0.75% and <1 mV. The chassis is made of polished stainless steel with a mirror-like surface. The black aluminum knob on the front consists of two parts - a knurled ring and a smooth roller. Once such a division was used to set the recording level for left and right channels separately. Here in this simple, cool way the volume control and inputs selection are handled. There are three unbalance inputs (RCA) and one balanced with mini-XLRs, and the selected shows a small LED just below the bottom edge of the front. The LED next to the knob informs user of the status of the amplifier. When it is red, it means that the signal is muted and the amplifier warms up; when it turns white – it's a sign that we can listen to music. Manufacturer used many excellent components including KáCsa Audió speakers posts, excellent resistors, WIMA polypropylene coupling capacitors, but above all very good looking, mechanically stabilized output and power transformers. The latter is a toroidal transformer, and it's fixed through a large wooden core. The unit is controlled by a radio remote control that is not sensitive to the position of the amplifier, that allows user to adjust volume and activate the "mute" mode. The remote is also made of metal with polished, mirror-like surface, so a rag with the company's logo, that one finds in the box, shall come handy quite often. My father, Laszlo Fabian, who is the owner of the biggest telecom company in Eastern Hungary, is the owner and founder of Audio-Hungary Ltd as well. He supports the company financially and leads the development of the products too. The whole company is his passion and an investment into future. We would like to become a recognized worldwide known brand in the future. Now Audio-Hungary has 16 employees, and more than 1000 square meters' factory. We have brought almost all manufacturing processes in house because of the unpredictability of the suppliers. The in house manufacturing process can be more strict and much more reliable for in time manufacturing. The prototype manufacturing and development process can also be much faster, it saves lots of money and time during the developing phase. Our distribution network is expanding with new distributors in new countries every year. Development process is continuous, we are refining the products continuously according to feedback of the customers and dealers. I placed the Audio Hungary amplifier on the top shelf of my Finite Elemente Pagode Edition rack. As the main source I used the Ancient Audio Lektor AIR V-edition CD Player connected using the Audio Revive RCA-1.0 Absolute-FM interconnect. The Harbeth M40.1 loudspeakers was connected with 4 Ω inputs using the Acoustic Revive SPC-3.0 Triple-C speaker cable. For the amplifier I used the Acoustic Revive Power Reference Triple-C power cable and passive Acoustic Revive RAS-14 Triple-C filter, while for CD Player I used the Harmonix X-DC350M2R Improved Version. The amplifier was switched on two our before each critical listening session. The KT120 was the first since many, many years, new construction in the KT series. Based on KT88, it was supposed to provide more power and more current, and it actually did. As soon as the audio manufacturers got acquainted with it, they started replacing their KT88 amplifiers with KT120 ones. The results differed from case to case. Whether by haste or lack of understanding of the new design, a lot of these devices, at least in my experience, did not perform too well. The high dynamics, high power and higher purity that the ones offered by the KT88 were obvious. There was no, however, this hint of magic that the older version offered in the midrange. After a year, maybe two, the situation began to change. As if it was finally understood that the sheer power was not everything and it was easier to degrade the sound with it than to improve it.